Since I have last blogged a lot has happened in my life. 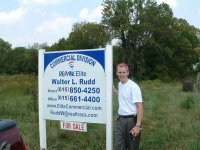 After deciding to close my management company and booking agency, I decided to get my real estate license and start selling commercial real estate to feed my family. 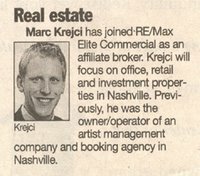 After a long arduous process of finding a place to affiliate with, I ended up joining the RE/MAX Elite Commercial team in Brentwood, TN (ps. I put together their website). Real estate, for me, has been a perfect fit. Because of my entrepreneurial spirit, my ambition/drive, and my unwillingness to put myself under a glass-ceiling, I think I will thrive for a long time in this industry. Plus, I have a built-in support system as well as a well known brand-name to go with. I chose to go with commercial over residential for many reasons. The main reason being that I am a numbers person and commercial properties are sold by the numbers, while residential is mostly by emotion. Also, the hours are much better. Business hours... 9-5, and I typically don't have to work weekends at all. Which has been wonderful to be able to spend more time with my family. Commercial is BIG and SLOW. It is very competitive because the payoffs are so large, but the deals usually take so much longer. Within my first 90 days, I made my first sale. Not too bad. In the meantime, while all of this is going on, I found the perfect outlet to be able to play music. A local community orchestra, the Trevecca Symphony Orchestra, was looking for bass players and it is just the absolute perfect fit for me. I guess the orchestra had a hard time retaining bass players because most of them play out regularly (with country, bluegrass, and other bands), and couldn't make practices/performances. Well, this is my only performance outlet and all I really want to play is classical/symphonic. There are 4 performances in the fall, and 3 in the spring. Next summer there are discussions about doing a european tour to the birthplaces of the music we are playing. God works in mysterious ways. Only when I seemingly gave up my musical pursuits did He bless me with what my heart adores. A few weeks back, I got a call about a man named Bill Deaton who was starting a new (non-country & non-christian) record label here in town called Gambit Music Group, and needed someone business minded, music savy, and ambitious to help him run it. It was a perfect fit because the real estate deals were taking a long time, and Gambit was ready to pay immediatly. Plus, it's only part-time! So I make my own schedule with both companies, and it works out just fabulous! Right now there are 3 artists signed to the label. Bob Carlisle, who did Butterfly Kisses, Lisa Weyerhaeuser, who is a folk/americana artist based in Chicago, and Jessa, who is a young girl who sings celtic/world music, kind of a blend of Enya and Peter Gabriel. We are also about to sign on Phil Keaggy for a project in the coming weeks, so stay tuned for that. I will keep you updated in the future on other projects we will be invloved in in the near future. 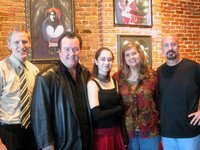 In the pictureL-R is me, Bob, Jessa, Lisa and Bill. That's it for now! Thank you all for all of your love and support!